[AUG. 12, 2000] "I can’t believe how much I didn’t hear!" After more than 20 years of not hearing things most of us take for granted, Eva Dahmm is celebrating everyday sounds again. She’s heard the squawk of a baby robin, the rustle of a mourning dove’s wings, the squeak of train wheels and the sizzle of eggs cooking in a skillet. This dramatic improvement came on July 13, when she got the headset to go with her new cochlear implant. 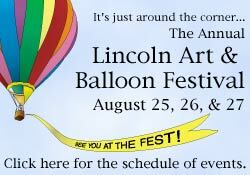 When she and husband George left the Carle Clinic in Champaign to drive home to Lincoln, she began hearing all kinds of new sounds. "I kept saying, ‘What is that? What is that?’" she says. "Some things sounded natural, as I remembered them, and some I couldn’t identify. When I got home I heard something strange. Then I realized I was hearing myself walking on the floor. I can hear the microwave. I can hear the beep of the remote phone. I know now that when you type on the computer it clicks, and the mouse clicks, too." "It’s been such a silent world for so long." She doesn’t know why she lost most of her hearing, but about 30 years ago she realized she wasn’t picking up everything that was going on around her. When her oldest grandchild was born 20 years ago, she couldn’t hear him cry until he was three months old. In 1988 she got a hearing aid. "In my right ear, everything was gone. With my left ear and the hearing aid, I could hear one-on-one, but when I was in a crowd there was too much background noise." 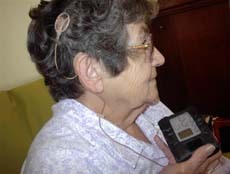 She could understand her four daughters – Muriel Barnard, who lives not far from her in Lincoln, Laura Tomlinson of Beason, and Vivian Valdes and Georgia Allison of Lincoln – and she had to depend on them to help her keep in touch with the hearing world. 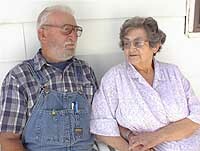 George, with his brother Wallace, has been a contractor for many years, and when he wasn’t home, Eva had to have her daughters help her with telephone calls. To make a doctor’s appointment, she would call one of her daughters, the daughter would call the doctor and get the appointment, and then call Eva back. "I felt isolated because I couldn’t contact people by telephone," she says. "I hadn’t been able to use the phone for 15 years." Later she joined a group called SHHH (Self Help for Hard of Hearing People) and learned about a telecommunication device which would help her overcome that isolation. 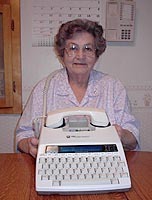 Called a TTY, it looks like a typewriter with a small screen on top and a holder for a telephone handset. Eva calls a relay operator and types in her message, and the relay operator calls the number Eva wants, relays the message and types a reply that Eva can read on the screen and also print out. 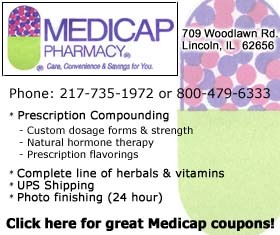 It is a free service, offered through the Springfield Center for Independent Living. Still, she was interested when a friend from Decatur came by to talk about her new cochlear implant. "She was ecstatic; she couldn’t say enough good things about it," Eva says. The friend also told the Dahmms the implant was in her worst ear, and she still could wear her hearing aid in the better ear. She came back a second time. "After she left, George and I talked it over. He said, ‘It sounds like a good idea.’ I said, ‘But it’s not your head.’"
To learn more, George called the Carle Clinic in Champaign and set up a visit with an audiologist. On March 30, Eva had tests to find out how much hearing was left. She had her second appointment on April 18, a talk with surgeon Dr. Michael Novak and a CT scan of her head. Eva and daughters Vivian and Muriel, both registered nurses ("my local medical advisers," Eva calls them), were impressed with the doctor. "He was very enthusiastic and upbeat. I had a feeling of confidence in him. He told me the good points and the bad points about the surgery." The bad points are that Eva would lose any residual hearing in the ear with the implant. Also, each individual’s response to an implant is different. Some people won’t have as good a result as others, and there is no way to tell ahead of time. There are also medical restrictions. Because the implant is an electrical system, Eva can never have an MRI again. Eva studied the procedure and decided to go ahead. By now she is a walking textbook on the subject. "The cochlea is a small organ in the inner ear, shaped like a snail shell, full of hair cells and fluid. When the hair cells are stimulated they send impulses to the auditory nerve, which sends them to the brain, where they are interpreted as sound. If the hair cells die you become hard of hearing," she explains. "The procedure for an implant is to make an incision and place a transmitter into the bone in the head above and behind the ear. Two leads come from the transmitter, smaller than pencil lead. One lead goes to the electrical array in the cochlea and the other, a ground, goes into muscles." For Eva this was outpatient surgery. "After the incision heals, a small round receiver is put on the head over the implant, held in place by a magnet. A microphone hooks behind the ear. It is attached to a processor, either a square about as big as a deck of cards or a smaller device which can also be worn behind the ear," she continues. "Sound comes into the mike, goes by wire to the processor and is changed into electrical impulses, which go back through the receiver to the transmitter and into the cochlear electrical array. It bypasses the dead hair cells and stimulates the auditory nerve to send signals to the brain." It takes about a year to get accustomed to the ways a cochlear implant can be used, and it is not the same as normal hearing. "This will not replace 30,000 dead hairs," Eva points out. It changes the way voices sound, which she describes as "kind of metallic." She hopes to be able to use an ordinary telephone one day. Not everyone is a candidate for the surgery, in particular those with damage to the auditory nerve or hardening of the inner ear. Still, Eva wants to encourage anyone with a hearing loss to investigate the possibility of a cochlear implant. She’s not self-conscious about wearing the hearing apparatus. "You don’t try to hide the fact that you wear glasses. You wear them so you can see. Why should you try to hide the fact that you’re wearing something to help you hear?" she asks. In January, when George and Eva celebrate their 50th wedding anniversary, they’ll probably go dancing, a favorite pastime. Eva could always hear drums and the piano, so she could keep the beat. Now she hears more. "The other day, listening to music, I knew I was hearing a trumpet. Then I heard a sweet sound that was saxophones." Eva is "having a ball" these days. "I’m always hanging out the window to see what I can hear," she says. Also, she thinks the implant will make everyday life a little smoother. "If I had had this a couple of years ago, I wouldn’t have run the battery down in my car. I didn’t know the car beeped when the light was left on."